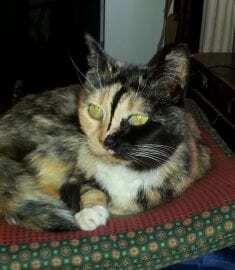 Mystique is a 4 times rescue beautiful little calico kitty. She found a furever home with me and even got along with my other 3 tuxedo kitty’s, Ester, her twin Little Peeps and Princess. All of whom are rescues. There just something special about her. She loved chicken and a little bit of cheddar cheese. I found ViaGen Pets after an online search and liked what I read on their site.